Way up in the sky at the top of the Silver Birch ~ a favourite place for the garden birds to catch the morning sunshine. ... that sky is so blue - did you paint it yourself??!! I love the way the sun shows up the colours on a starlings feathers they go the colour of petrol on a puddle ! On sunny winter mornings the Silver Birch is full of birds drying out their plumage ... starlings, sparrows, wood pigeons ! Lovely picture. The starlings here are in a huge flock that descends into our garden and eats everything up. We have sunshine and thin clouds today. The full moon this morning earyl had a halo of light around it and the stars were so bright and twinkly. Hi Linda. I'm pleased you like this. Just a few starlings in my gardens .. used to get more, but these days there are more blackbirds. Its sparrows today, I,d got some muesli I didn't want well they certainly did! Lovely weather. I've mown my lawns. Five star feathered friends restaurant at your place ! :o)) keeping feathers clean for flight, they will tell the other birds Roman baths at Terratoonies lol. Thanks. I've not heard of that term 'shepsters'. Looks like you are very lucky having a bit of sun Terra - it is cold and very grey here but I suppose it could be worse because at least we don't have snow yet! The sun has gone now, and the skies have darkened. Thanks. The sky really was that blue. Lovely pic Terra and November already......gad zooks! Saw on Autumn Watch last night that the last garden survey revealed yet another drop in numbers of resident starlings. Average of 3 seen in the gardens at one time. Those amazing mumuration flights are stocked by a lot of migrants apparently.....how do they know that? 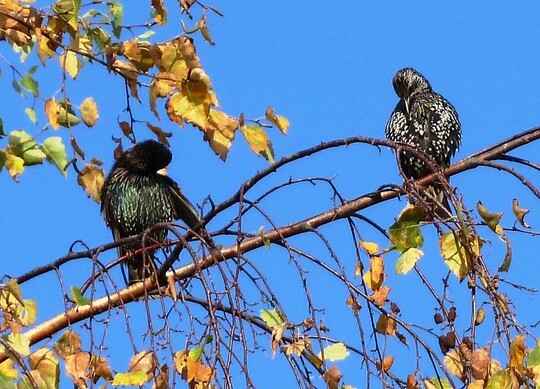 Yes, there are less resident starlings these days. With old fashioned wooden fascias on houses, starlings could often find broken corners for nesting. It seems that modern replacements of plastic fascias have removed many suitable places for starlings to nest. Woww TT, you are the one!!! Starlings have been few and far between,here,TT......only today one was feeding from the bird station.Lovely photo! Thank you. I find that my bird baths are the attraction for the starlings ... looking so comical as they splash about together ! Saw a huge flock of thrushlike birds with red breasts go over are they redstarts or redwings I always get them muddled up? thanks Woodlandwo they were all talking to each other as they flew over my head.